The upscale Mexican food trend may be nearing an end. The face of Baja Calfornia Mexican cuisine, celebrity chef Javier Plascencia has announced that he has separated from his San Diego-based restaurants Bracero Cocina de Raiz in Little Italy and Romesco Mexiterranean in Bonita to focus on his ventures south of the border. Chef Javier Plascencia recently published an article on VICE entitled, "Why It’s So Hard to Open a Modern Mexican Restaurant in the US", that, combined with the recent minimum wage hike in California, makes it of little surprise that his frustrations with operating a restaurant north of the border have finally boiled over. In his VICE article, Plascencia detailed the hurdles of opening a restaurant in the United States. "In Mexico, you can kind of do whatever you want when you open a restaurant," Plascencia stated in his October 2016 VICE article. "They are not as strict with permits and laws. When you open a restaurant in the US, the legal processes for things can be horrible." Javier Plascencia was born into the restaurant industry, as his father opened one of Mexico's first pizzerias. 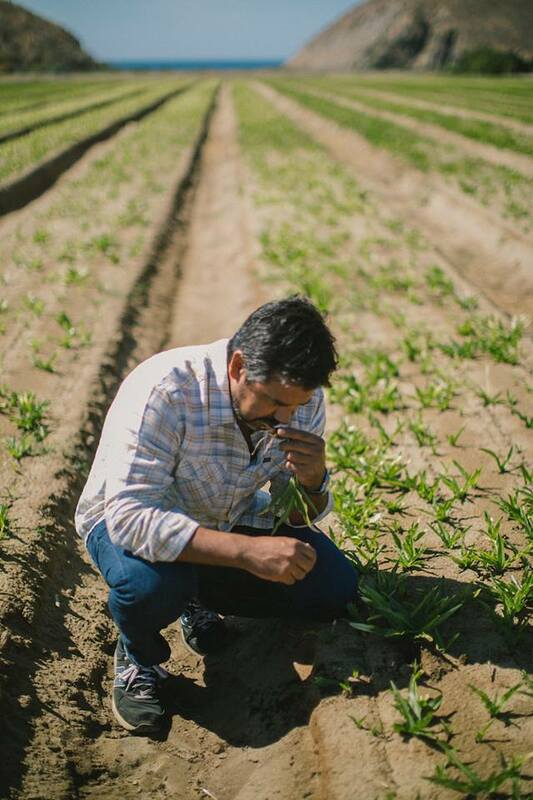 Plascencia now has ownership interests in at least a dozen different concepts in Mexico's Tijuana and Valle de Guadalupe regions under his family's Grupo Plascencia company, including Mision 19, Caesar's, Finca Altozano, Giuseppis, Villa Saverios, Khao San, Erizo, and Finca La Divina bed and breakfast. During hard times in Tijuana in the early 2000s, Plascencia sought refuge from the violence and hardships in Mexico and moved to San Diego County, which inspired him to open Romesco in Bonita in 2006 to critical acclaim. He steamrolled his successes and launched Bracero in 2015, a highly anticipated concept in the heart of San Diego's culinary hub of Little Italy that was nominated for the James Beard Award as best new restaurant in the US. 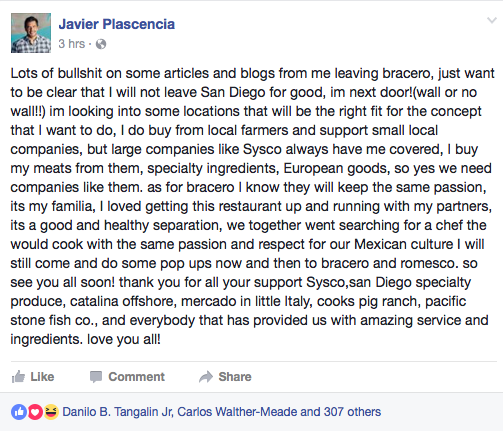 Plascencia announced that in 2017 he will part ways with Mexiterranean Hospitality, the company that owns and operates his United States-based eateries - Bracero & Romesco - citing business disagreements with his former partner and brother-in-law Luis Peña as a reason. He intends to focus his energies on his Mexico concepts, including opening a chain of boutique hotels and is currently eying a space in San Diego for a new concept. Plascencia remains highly active on the culinary front south of the border. He recently opened Lupe food truck, a torta-centric concept sited at his Finca Altozano restaurant in Valle de Guadalupe, which he has indicated as a possible concept for expansion in San Diego. Plascencia is also currently working on the opening of Restaurant Jazamango in Todos Santos, Baja California Sur, which he aims to open in early 2017. 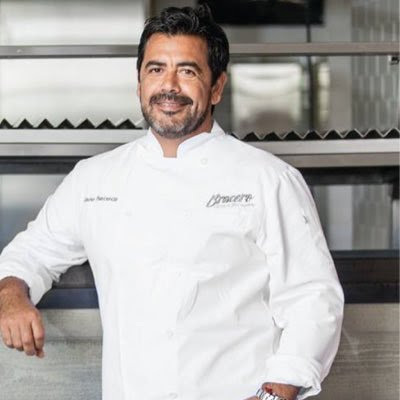 "I truly wish Javier the best of success, and along with reflecting upon so many highlights we have shared together, such as being nominated for the James Beard award, San Diego’ Best Restaurant awards and creating unique spaces for people to savor the roots of Mexican cuisine and history, I continue to look at the road ahead with great anticipation,” commented Mexiterranean Hospitality co-founder Luis Peña. With Plascencia's departure Chef Eduardo "Lalo" Covarrubias has been tasked to lead the Bracero kitchen. Chef Lalo plans to continue Bracero's legacy, including maintaining the effort to bring Mexican-Mediterranean cuisine into more of a traditional-contemporary focus for the restauran. As a tribute, many of Javier’s special dishes will remain. As far as Romesco, Mexiterranean Hospitality, now lead by Luis Peña, is looking into further expanding the traditional bistro more northward into San Diego proper, possibly downtown or further up the coast.